The worldwide smartphone market grew 38.8% year over year in the third quarter of 2013 (3Q13), according to the IDC. Thus, a total of 258.4 million smartphones were shipped in 3Q13, establishing a new record for units shipped in a single quarter by more than 9.0%. The previous high was 237.0 million units shipped in the second quarter of 2013. Price points have declined significantly, driven largely by low-cost Android solutions.China has become one of the fastest growing smartphone markets in the world, accounting for more than one third of all shipments last quarter. This trend is expected to continue going forward. The Android smartphone platform has created vast opportunities for new vendors to get into the smartphone space and, in turn, has produced new competitive pressures at the top of the market. Vendors from outside the top 5 continue to control nearly half the worldwide smartphone market in terms of shipments. In 3Q13, Chinese vendors Huawei and Lenovo moved past LG, and not far behind are two more Chinese companies, Coolpad and ZTE. Any of these vendors could change position again next quarter. But in addition to having close shipment volumes, they all have one key ingredient in common: Android. This has been a huge factor in their success, but it also speaks to the challenges of differentiation on the world’s most popular platform.Looking ahead, strong momentum is expected to continue going into the fourth quarter, and another record quarter and year in the worldwide smartphone market. With already strong growth in 3Q13 and multiple vendors launching flagship models, the market will be poised to reach one billion units for the year. It’s a significant milestone considering the market shipped just half a billion units in 2011. Moving forward, what remains to be seen is how the various companies and platforms will stay differentiated and relevant in the increasingly competitive market. In the worldwide mobile phone market (inclusive of smartphones), vendors shipped 467.9 million units in 3Q13 compared to the 442.7 million units shipped in 3Q12, representing 5.7% year-over-year growth. Third quarter shipments were up 7.0% when compared to the 437.4 million units shipped in 2Q13. Interestingly enough the category of phones apart from the smartphones reduced by 18.4% from 256.5mln handsets in Q3 2012 to 209.5mln Q3 2013. Feature Phones are thus a shrinking category globally! 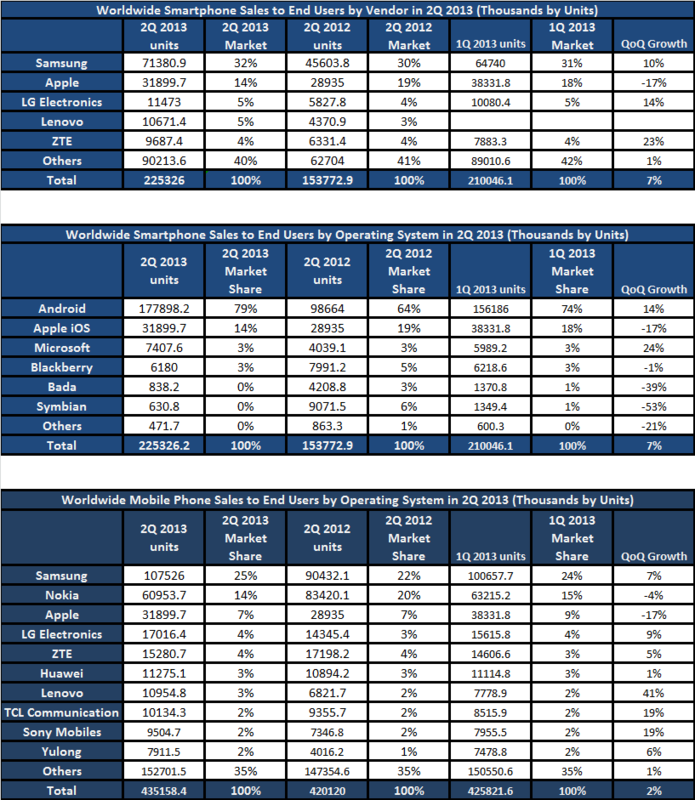 Android and Samsung gain, Apple and the iOS stumble, Microsoft gains and Blackberry looses – The story doesnot change in the Global Smartphone and Feature Phone markets. Gartner seonds the numbers provided by IDC – showcasing the nearly irrevocable rise and rise of Android at the expense of everyone else. Apple seems to be caught between a rock and a hard place: go for market share with cheaper iPhone then risk losing premium status; stay premium then risk losing relevance. Apple’s performance outside the US market seems to be weakening. Samsung on the other hand appears to have succeeded in straddling the smartphone landscape. Nokia’s smartphone numbers indicate it as the come back kid. In its Q2, 2013 report, Nokia reported a rise in Lumia shipments, to 7.4 million, and a drop in feature phone shipments, to 53.7 million. However a neagtive movement on the ASPs pegged it down. Currently, the 30% increment of sales in Lumia’s didnot offset the southward movement of ASPs. Nokia’s smartphone balance and its profitability has still not found a balance. The Chinese foursome of Huawei, ZTE, Yulong and Lenovo are beginning to dominate the positions 4 to 7 in the smartphone and mobile phone charts indicating the growing strength in China and other Asian smartphone markets. As smartphones massify and the markets move towards the lower end ASP points, it would be interesting to note how Samsung, Apple and Nokia play out and how the Chinese vendors pick pace. It will be critical for the smartphone makers to step up in the mid-tier and also be more aggressive in emerging markets. Innovation, after all cannot be limited to the high end. 3. …. And Buoyed by 43% increase in the smartphone shipments (210 million Q1, 2013 versus 147 million Q1, 2012)! 4. Smartphone sales accounted for 49.3 percent of sales of mobile phones worldwide in the first quarter, up 34.8 percent year-on-year. 5. Only the Asia/Pacific region contributed to mobile phone sales across the globe, with a 6.4 percent increase year-on-year. More than 226 million mobile phones were sold to end users in Asia/Pacific in the first quarter of 2013, which helped the region increase its share of global mobile phones to 53.1 percent year-on-year. China saw its mobile phone sales increase 7.5 percent in the first quarter of 2013, and its sales represented 25.7 percent of global mobile phone sales, up nearly 2 percentage points year-on-year. 7. Apple, is estimated to have secured 18.2 percent of global marketshare, a drop of 4.3 percentage points. Apple’s redemption has been the Chinese market with the lower price of the iPhone 4 making China a key revenue generator for the tech giant. However, with no new products due from the Apple stable until the fall, the next quarter may drag Apple’s market shares significantly downward. 8. In terms of operating systems, Android continues to race ahead of rival systems, claiming 74.4 percent of global marketshare. 156.1 million smartphones running Google’s operating system were sold in the first quarter, whereas Apple’s iOS claimed an 18.2 percent slice of the market with iPhone sales. With new OSs coming to market such as Windows,Tizen, Firefox and Mozila, one can expect some market share to be eroded, but not enough to question Android’s volume leadership. 3. Although we see a huge market ‘hype’ around smartphones, the fact remains that the India mobile handset market is still dominated by shipments of feature phones. 6. The market remains largely fragmented across a huge number of Players – most of them white labeled Indian brands manufactured in China. 7. With the entry point of smartphones coming down to about Rs.3000-4000, 2013 could be the tipping point for smartphone adoption in India as buyers intending an upgrade purchase would make the jump to smartphones. Long time back, i had written a blog on the subject of smartphones becoming the key handheld at the cost of feature phones. If the Gartner 2012 numbers are to be considered, the saturation point for feature phones has been reached and the 2012 feature phones numbers – have been on a 1.66% decline as against 2011. Incidentally, i see another trend – that of smaller players/ white-labelled OEMs- and a fragmented market emerging – a far cry from the Nokia and Samsung dominance days. The rise of Android is but actually a testimony to this trend with the exception of Samsung. With no malevolence to Samsung – it does seem to me that Samsung is holding on to a untenable position in shares in mobile devices with the white labeled OEMs on the prowl. While Apple will still hold on to the smartphone ground (because of its ability to leverage hardware, software , services and experience), Samsung doesnot hold that ace with Android. This inspite of the fact that Samsung Galaxy series was the first high end Android that has challenged and now dethroned technology leadership of the iPhone. The end result looks like an Android dominated market, though there could be a case of Android fatigue setting in with the audiences. However with the low end $50 smartphones on Android’s the numbers for Android will continue to add up especially in APAC and African markets. 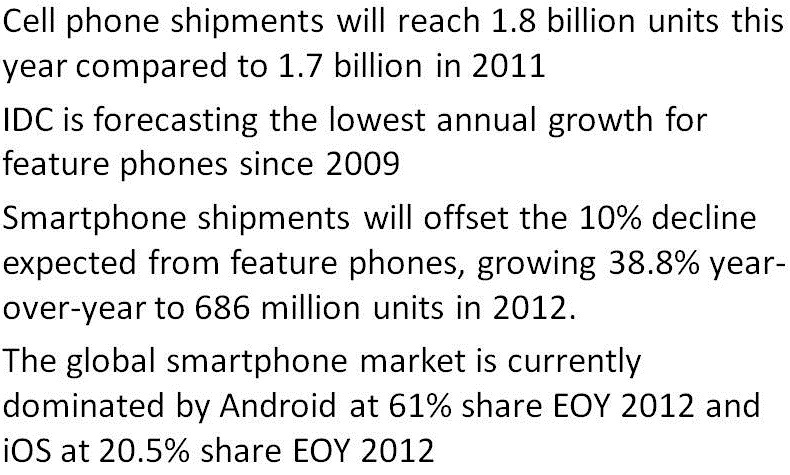 Thus Android is expected to still rule the volumes game on smartphones. It would be interesting to see how Windows and Blackberry go after Android – but the key still remains that – Android is the undisputed choice in smartphones in the fastest growing markets across the world. Windows and Blackberry will take time reversing this trend. Worldwide sales of mobile phones to end users reached almost 428 million units in the third quarter of 2012, a 3.1 percent decline from the third quarter of 2011. Smartphone sales accounted for 39.6 percent of total mobile phone sales, as smartphone sales increased 46.9 percent from the third quarter of 2011. Smartphones continued to fuel sales of mobile phones worldwide with sales rising to 169.2 million units in the third quarter of 2012. The smartphone market was dominated by Apple and Samsung. Both vendors together controlled 46.5 percent of smartphone market leaving a handful of vendors fighting over a distant third spot. In the smartphone market, Android continued to increase its market share, up 19.9 percentage points in the third quarter of 2012. 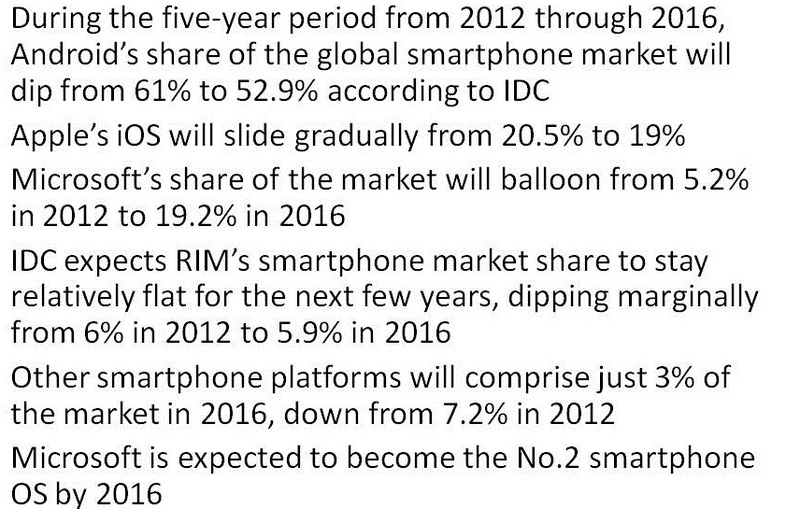 Although RIM lost market share, it climbed to the No. 3 position as Symbian is nearing the end of its lifecycle. Channel destocking in preparation of new device launches for RIM, resulted into (lower than usual) 8.9 million sales to end users in the third quarter of 2012. With the launch of iPhone 5, Gartner analysts expect iOS share will grow strongly in the fourth quarter of 2012 because users held on to their replacements in many markets ahead of the iPhone 5 wider roll out. Windows Phone’s share weakened quarter-on-quarter as the Windows Phone 8 launch dampened demand of Windows Phone 7 devices. Demand slowed further in the second quarter of 2012. The challenging economic environment and users postponing upgrades to take advantage of high-profile device launches and promotions available later in the year slowed demand across markets. Smartphone sales accounted for 36.7 percent of total mobile phone sales and grew 42.7 percent in the second quarter of 2012. Samsung and Apple continued to dominate the smartphone market, together taking about half the market share, and widening the gap to other manufacturers. No other smartphone vendors had share close to 10 percent. In the race to be top smartphone manufacturer in 2012, Samsung has consistently increased its lead over Apple, and its open OS market share increased to one-and-a-half times that of Apple in the second quarter of 2012. 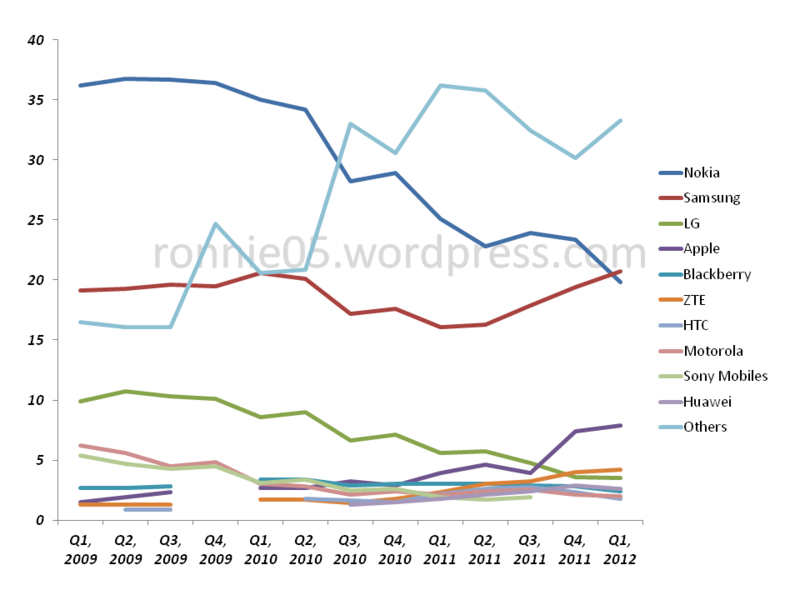 In the smartphone OS market, Android extended its lead with an increase of 20.7 percentage points in market share in the second quarter of 2012. While Apple’s iOS market share slightly grew year over year (0.6 percent), it declined 3.7 percentage points quarter on quarter, as users postponed their upgrade decisions in most markets ahead of the upcoming launch of the iPhone 5. Will Microsoft’s fragmentation take Nokia down? Even while Windows8 has just been announced, the spectre of platform fragmentation is turning out to be a real bogey for the bealeagured Nokia. Nokia shares plunged 18 percent this June after forecasting a wider second-quarter operating loss from handsets and 10,000 job cuts. After wiping out about $100 billion in market value, Espoo, Finland- based Nokia trades at a 38 percent discount to its net assets, the least expensive on record, according to data compiled by Bloomberg dating back to 1995. Reeling under the impact of business slowdown, loss of market share both in smartphone as well as low and mid range, Nokia had pinned all its hopes on the Windows platform as a differentiator and a saviour. However, if the Windows8 is any indication Microsoft doesnot really accord as faith and importance to Nokia as much as Nokia would have really liked it. The Windows8 will be released with 4 OEMs – Samsung, Nokia, HTC and Huawei. Thats not much comforting for Nokia having to vie with an in-form Samsung . 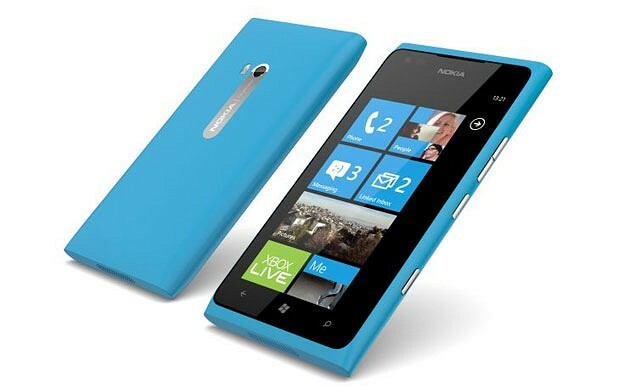 6 months back, the Lumia 900 was considered the exemplar of Microsoft’s new operating system, Windows Phone. However, the saviour of Nokia smartphones was not quite the messiah it was touted to be. As a result of poorly planned platform migration, Microsoft Windows8 would not be available to Lumia 900 owners. Eevn while Nokia sold two million Lumia handsets in the first quarter of 2012 but the company’s top device has essentially been rendered out of date within a year. This can be looked at from two ways – Microsoft’s platform fragmentation and its inability to bridge the Windows7.5 and Windows8 platforms can leave a lot of the early OEMs high and dry. Worse with the hype and hoopla around Windows8, sales of the Windows7.5 devices are effectively going to stall for a while. The OEMs will be under pressure to undercut prices for distress sales. Thats not great for the bottomline of Nokia which has increasingly been loosing faith with the markets. (Moody’s, Fitch and S&P have already cut down Nokia’s credit rating to Junk). Secondly, while, Elop’s strategy of jumping of the Symbian “burning platform” was good forbearance, its deserting of Meego and “dont even touch it” stance with Android have really not worked for Elop. Possibly a risk diversification would have helped especially with the Meego platform. So while Windows fragments, Nokia’s primal fear is to stay afloat in an environment which evolves from Windows7.5 to Windows8 on cash reserves which aren’t comforting really. Will Nokia see the end of 2012? 60-40 it wont. Zach Epstein, exe. editor of BGR had an interesting set of observation on the OS triumverate and the Android growth story to end in 2012 as Microsoft begins to steal Google & Apple’s thunder. The basis is the IDC report which sees a shift in the OS ranking ladder with Microsoft Windows 8 scoring a few points at the expense of Apple iOS and Android. While a brief summary of the IDC report is as given below, the facts and the findings are not much changed. Smartphones are expected to grow albeit a slow trot given the increasing base. Feature phones will register declines pulling down the industry numbers. On the OS dominance, Android will remain status quo although Windows could ride its way past Apple into what could be a second life for Microsoft post PC era. Legacy systems will provide Microsoft the traction in the market. Reflecting further, what could really influence the tables by 2016 is cross platform play – TV, mobile, car. For some time now Android and iOS focus has been to shift into other platforms which will augment mobile and be driven by mobility. To me Android and iOS may slow down but they will diversify into these platforms which will rub off on the mobile numbers. Developers as well will see this as a unique opportunity for multi platform presence through the cloud. So while the triumverate theory still holds, what is interesting is how OSs will migrate across platforms and the experience factor. Android has a spot of bother on that and Apple is heads and shoulders above others. Ultimately it is the seamless play across different computing and content/consumption platforms which really will sway sway developer communities.Cross platform pressence, migration, experience and abilities will form the future of mobility. Blackberry- I think that story is done and dusted. Worldwide sales of mobile phones to end users reached 419.1 million units in the first quarter of 2012, a 2 per cent decline from the first quarter of 2011, according to Gartner, Inc. This is the first time since the second quarter of 2009 that the market exhibited a decline. The slow down in the first quarter was attributed to a low demand in Asia Pacific in view of generally less exciting product launches. Samsung became the world’s top mobile handset vendor during the quarter, displacing Nokia which had held the No. 1 spot since 1998. Samsung took back the world’s No. 1 smartphone position from Apple, selling 38 million smartphones worldwide. In addition, Samsung’s Android-based smartphone sales in the first quarter of 2012 represented more than 40 percent of Android-based smartphone sales worldwide; no other vendors achieved more than a 10 percent share of the market. 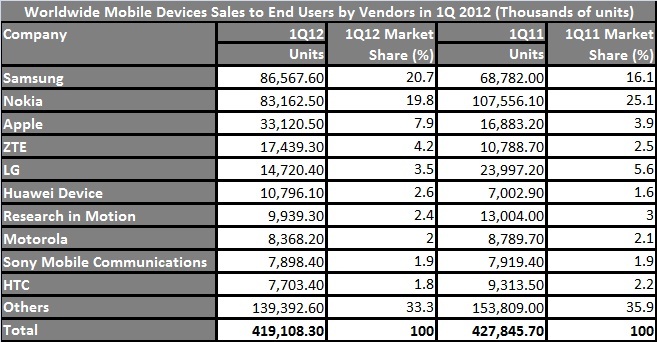 Sales of smartphones continued to drive mobile device market growth, reaching 144.4 million units in the first quarter of 2012, up 44.7 percent year-over-year. This quarter also saw the top two smartphone vendors, Apple and Samsung, raising their combined share to 49.3 percent, up from 29.3 percent in the first quarter of 2011, and widening their lead over Nokia – which saw its smartphone market share drop to 9.2 percent. 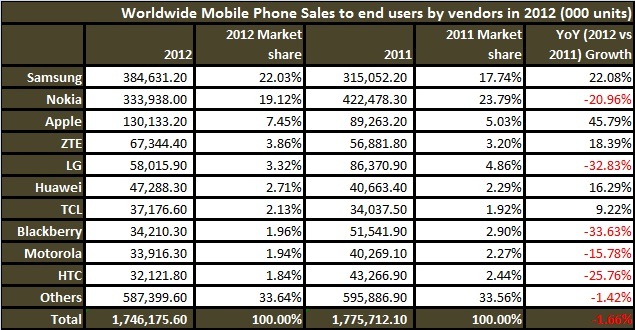 Nokia’s mobile handset sales reached 83.2 million units, a 22.7 percent decrease from the first quarter of 2011. 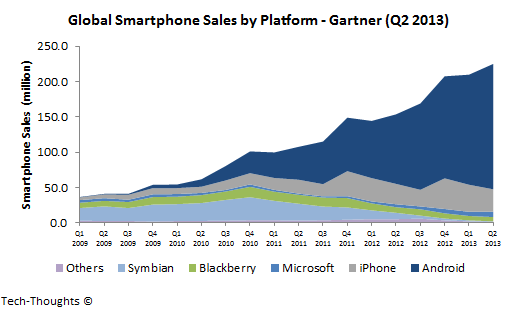 The mobile phone market shares over the last 13 quarters are plotted above. Interestingly, even while the market has grown in the last 13 quarters by 55% from 269.1 mln units in Q1 2009 to the present volumes, what explains Nokia’s loss in not an other incumbent but the rise of the “Others” category. One would associate Micromax, Karbonn, Spice, Lava and other local white labelled brands in this space. The irony is back in 2008, when Nokia was at its zenith, this threat was widely rubished by most of the high ups in Nokia as a passing fad.